Baked salmon with easy lemon-dill sauce is one of our favorite weeknight meals, so I’m excited to share it with you! For the salmon, I always try to find a wild-caught selection that is either fresh or frozen. Right now, I am loving the organic wild-caught salmon from HEB (in the fish case). I also like the frozen Orca Bay wild-caught salmon (in the freezer section at my local Randall’s) because it’s so convenient. One thing about the Orca Bay salmon, though: Be sure to watch for bones! We’ve found one in nearly every filet so far. Line a baking sheet with parchment paper (or aluminum foil). Place the filets of salmon, skin side down, on the parchment. Drizzle the fish with olive oil and season with salt and pepper. Place the baking sheet with the fish into a *cold* oven. Then turn the oven to 400 degrees F. Bake for about 14 minutes, letting the fish cook slowly as the oven temperature rises. Take the salmon out and let cool. Or, if you like your salmon more well-done, let it cook for 2-3 more minutes. Serve warm or at room temp. So let’s move on to the sauce. Four ingredients and five minutes is all you need . . . full recipe is below. 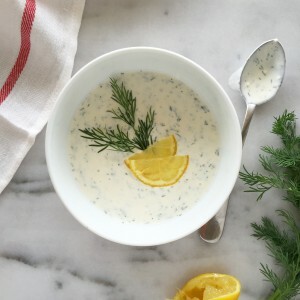 Put the yogurt, mayo, lemon juice and dill into a bowl. Stir well. Season with salt and pepper; taste. Adjust seasonings and serve! The sauce can be made up to one week ahead, so this is a GREAT one for weekend meal prep. Also, in addition to serving it with any kind of fish, I love to use the sauce as a dip for veggies, or alongside chicken or pork. So even if you don’t like salmon, the lemon-dill sauce is definitely one to add to your spring menu!